I had been waiting for a quick pullback on this pair ever since Pip Diddy featured a short-term uptrend on his daily watchlist. However, the pair barely looked back on its climb as pound bulls still seem to be hopeful that Brexit can be avoided altogether. 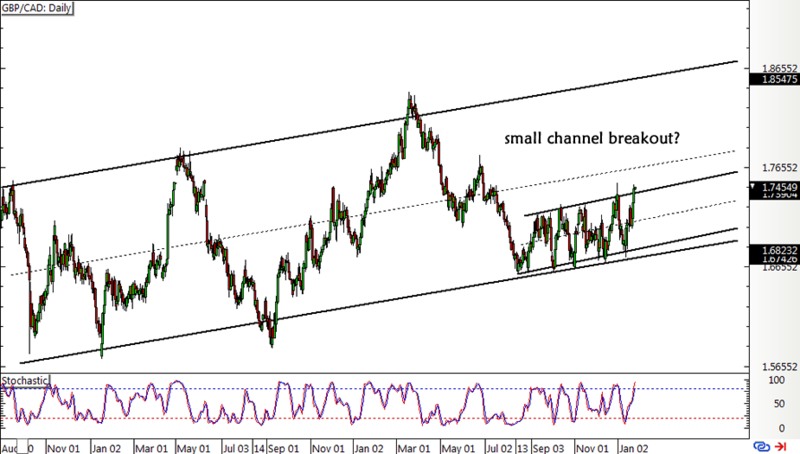 On the daily time frame, I noticed that the pair is starting to bust through the top of a small ascending channel as it already closed above the resistance. This could put it on track towards testing the next ceiling at the mid-channel area of resistance on a much MUCH larger ascending channel visible on the long-term chart. If bullish momentum still won’t let up, pound bulls might even take GBP/CAD all the way higher to the very top of the longer-term channel! Even though the Brexit situation is looking pretty grim these days and talks of a “no deal” outcome are still going, I’m inclined to think that the Brits would do whatever it takes to avoid a disastrous or disorderly divorce. The options of having a second referendum, extending Article 50, or backing out from Brexit might still be on the table. On the flip side, things aren’t looking so sunny for commodities and higher-yielding currencies as the IMF recently downgraded global growth forecasts… again. This, combined with persistent geopolitical risks such as trade tensions and the U.S. government shutdown, could keep a lid on risk-taking and energy demand. Crude oil is starting to reel from these negative expectations, and it doesn’t help that the EIA is projecting higher shale production for the following month. I’m not very confident about catching breakouts, so I’m gonna keep my eyes peeled for quick pullbacks or continuation patterns that could convince me that there’s more bullish momentum in the cards. What do you guys think?